To kick off the club’s golden anniversary in earnest, the Kings will welcome nearly 20 former members of the organization when they play host to the Philadelphia Flyers in their home opener on Friday, October 14, which takes place 49 years to the day that the teams met for the very first game in Kings history. Details on those scheduled to attend are below, courtesy of the club’s PR staff. 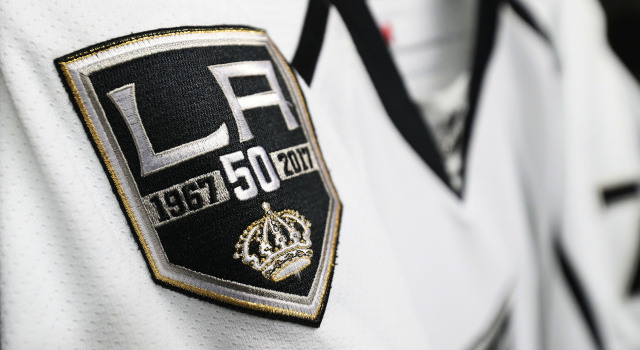 In addition to the Legends Nights that will celebrate the legacies of Ziggy Palffy (December 31), Tomas Sandstrom (January 7), and Jari Kurri (January 14), the Kings will also host five 50th Anniversary Heritage Nights commemorating the Los Angeles careers of Jaroslav Modry (October 22), Steve Duchesne (November 5), Rogie Vachon (November 19, shortly after his Hall of Fame honors), Larry Robinson (November 26) and Mike Murphy (December 10), in which the former All-Stars will drop the ceremonial puck at center ice. Butch Goring will also drop the pre-game puck on November 23. The Kings also announced that they will unveil a new bronze, granite and glass monument outside Staples Center prior to the game against Chicago on Saturday, November 26. Los Angeles opens the season at San Jose on Wednesday, October 12 (7:30 p.m. / NBCSN). The home opener against Philadelphia on Friday (7:30 p.m. / FOX Sports West) will be preceded by “In My Own Words/Anze Kopitar” at 5:30 p.m., the Kings Live Season Preview show at 6:30 p.m. and the Kings Live pre-game show at 7:00 p.m. It will be the only game this season the team will wear their vintage gold jerseys. More details on the opening night festivities, as culled from a team press release, are below. Fans are encouraged to be in their seats by 7:00 p.m. for Friday’s home opener. The festivities will also be broadcast live on FOX Sports West. Bryan Campbell started his professional career in the Kings system after being claimed by Los Angeles in the 1967 Expansion Draft. Appearing in 93 regular-season games with the Kings, he scored 12 goals and added 20 assists over his three seasons including six goals and 15 assists during his rookie campaign. He went on to play 260 NHL games. Jacques Caron got into his first NHL game with the Kings during the 1967-68 campaign after playing for minor-league Springfield during the 1960s. He appeared in three games the following season and played a total of 72 NHL contests. He won three Stanley Cups as goaltending coach with the New Jersey Devils in 1995, 2000 and 2003. Mike Corrigan played for the Kings over seven seasons from 1967-76, with a stop in Vancouver during that period as well. He played in more than 400 regular season games with the Kings and totaled 230 points (106-124=230). In the 1972-73 season he scored a team-high 37 goals and finished third overall in club scoring that season with 67 points. Brent Hughes played parts of three seasons for the Kings from 1967-70. The defenseman registered 14 points in 44 games in 1967-68; 21 points over 72 games in 1968-69; and then he racked up 108 penalty minutes during his 52 games in 1969-70. He played 168 regular season games with Kings and totaled 43 points (7-36=43). Howie Hughes spent parts of three years with the Kings in the late 1960s at right wing. His best season was 1968-69 when he scored 16 goals and added 14 assists over 73 games. He played in 168 NHL games – all with the Kings – recording 25 goals and 32 assists for 57 points. Ted Irvine was a hard-working left wing who scored 18 goals and added 22 assists during his rookie season with the Kings in 1967-68. He followed it up with a 39-point sophomore campaign, good for fourth in club scoring both years. He played in 207 games with the Kings, racking up 103 points (44-59=103). Larry Johnston made four appearances with the Kings in 1967-68. He spent the next two seasons with the Kings’ American Hockey League affiliate in Springfield, leading the league in penalty minutes with 240 in 1968-69 and 150 in 1969-70. He was named the Most Valuable Player in Springfield in 1969. Brian Kilrea was a center who has the distinction of scoring the first goal in the history of the Kings’ franchise. He appeared in 25 games with the Kings in 1967-68, lighting the lamp three times while and adding eight assists. In 2003, he was inducted into the Hockey Hall of Fame in the Builders category. Jacques Lemieux spent parts of three seasons with the Kings from 1967-70. The steady blueliner played 16 games with the club in 1967-68, assisting on three goals. He appeared in one playoff contest the following season and then played three games with the team in 1969-70. Lowell MacDonald played two seasons with the Kings from 1967-69. The winger finished third on the team in scoring with 21 goals and 24 assists during the 1967-68 season while adding seven points in seven playoff games. The following year he tallied 14 goals and collected 14 assists in 58 regular season games, plus five points in seven playoff appearances. Howie Menard appeared in 151 NHL games, 91 of those with the Kings over parts of two seasons. He scored nine goals and added 15 assists over a 35-game stretch in 1967-68 while chipping in five assists in seven post season appearances. The following year he potted 10 goals and 17 assists over 56 games while adding three goals and five points in 11 playoff contests. Poul Popiel — born and raised in Denmark — played one regular season game for the Kings. It came during the 1967-68 season, after he posted 35 points and 180 penalty minutes with the club’s AHL affiliate in Springfield. The defenseman, the first native of Denmark to play in the NHL, also scored a goal in three playoff games with the team that same season. Bob Wall, the first captain of the Kings, played three seasons with the club from 1967-70. Serving as captain the first two campaigns, he recorded five goals and 23 points in 1967-68 and 13 goals and 26 points in 1968-69. Over 212 regular season games with the Kings, he totaled 23 goals and 44 assists for 67 points. John Kenneth “Jiggs” McDonald is the “Original Voice of the LA Kings,” working in Los Angeles from 1967-72 during the club’s very first five seasons. He called the club’s first preseason game, first regular season game and first playoff game. He has also worked as a club broadcaster for the Atlanta Flames, Florida Panthers and the New York Islanders, totaling more than 3,000 contests. In 1990 he was the recipient of the Foster Hewitt Award, which is recognized by a plaque in the Hockey Hall of Fame in Toronto. Jack Kent Cooke is the founding owner of the Kings. Mr. Cooke passed away in 1997 and is represented in the club’s 50th Anniversary celebration by his son, John Kent Cooke. Hockey Hall of Famer Leonard “Red” Kelly is the club’s original coach. He is unable to attend but taped a special video message that will be played on Opening Night. -In addition to a reunion of the 1967-68 Kings before the Kings’ regular season home opener presented by McDonald’s the evening will also feature a number of surprise guests and the Kings will wear their original Vintage Gold uniforms for the only time this season. -The 50th Anniversary Season Opening Weekend concludes when the Kings serve as a presenting sponsor and lead honoree of the Children’s Hospital Los Angeles Gala on Saturday, October 15. That evening will be a highlight of the Kings’ plans in the community this year along with the “Forever 50” community legacy program. It will feature current Kings players and staff and alumni. Actress Drew Barrymore will also be honored and singer Katy Perry will perform. For media information on the special event please contact Monica Rizzo (mrizzo@chla.usc.edu / 323-361-5745).